Hey if you want to discourage people from teaching by threatening their 1st amendment rights, knock yourself out. We do not want to reward assholery. If their first amendment rights results in a black eye for DMS then DMS is more than capable of giving said member a boot to the curb. You need to think very carefully about making rules or precedence that effect what members do outside of the space. In my work in public relations and customer service, if this type of thing happened in a company, it would require a timely official answer, since DMS was directly and negatively named as an agenda item in the other makerspace. My opinion is that DMS’ reputation would benefit from leadership crafting a statement to the other makerspace, possibly using @Draco’s words as a framework, stating that DMS encourages cooperation and not competition with other spaces. It needs to also acknowledge that as a volunteer membership organization, DMS does not control the conversations of individual members, and regrets that this incident occurred using the DMS name. since DMS was directly and negatively named as an agenda item in the other makerspace. What does any of that to do with releasing a true general statement? Never said I was for it now, did I? DMS should disavow what this member said as suggested by others. As the issue currently stands it’s hearsay. All this could change should The Lab reach out to us and provide relevant details. But it’s not something to act upon as things stand. Seems to be a lot of angst about something that started out as more of a heads up notice from a DMS member saying a publicly viewable BoD agenda item at The Lab mentions member behavior that some view with concern. I would interpret this to suggest that if The Lab’s BoD agrees with the concern and wants to pursue with DMS, then DMS will hear more. By it being raised on Talk, DMS has a chance to ponder the issue IN CASE more comes if it. I would suggest that a productive discussion at this stage might be to ask: how would DMS membership feel if visitors from The Lab or another similar entity were to come lobby DMS teachers to quit teaching here and go teach at their place instead. When DMS has answered that question, it would be well positioned to respond IF The Lab does approach. I wouldn’t care. Competition makes things better for everyone. 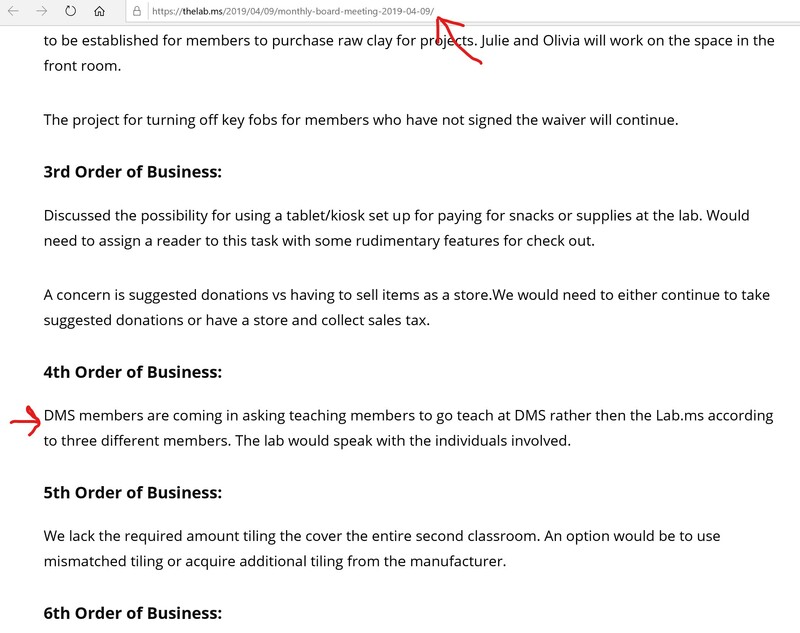 To clarify, the agenda item for The Labs is a live, public internet page, linked by @Bill in the first post on this thread because I am guessing someone brought it to his attention. I checked the link before answering the way I did. I’m not referring to the validity of whether the conversations happened or not since I wasn’t there. 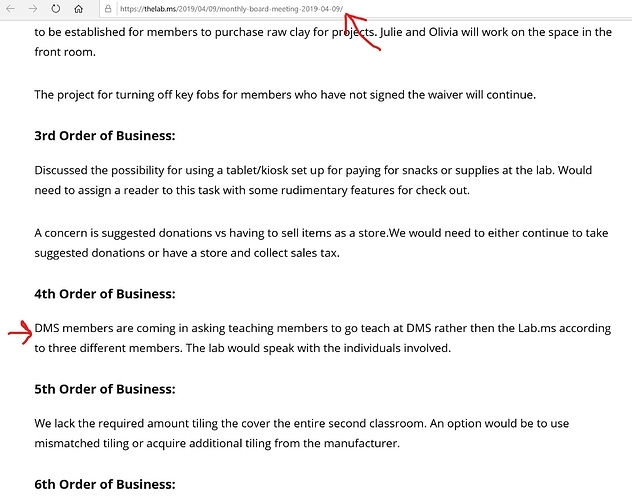 My statement is in reference to the agenda item which specifically mentions DMS, which can be fact-checked on the other makerspace’s website. It’s entirely up to leadership whether or not to make an official statement. This can literally be a one paragraph email saying what I said above, or something else they deem appropriate. Yup. I read it for myself before posting in this thread. And assuming it’s as laid out in their brief description, I agree the optics are bad for both the DMS member(s) involved and DMS. But for apparent lack of communication from The Lab to DMS I remain of the opinion it’s not particularly actionable on our part. I guess it depends on whether we want to nip it in the bud or let it fester. Personally, if someone was saying something bad about me that was on a public website, I’d want to proactively reach out and get the issue solved. I recognize other people have different ways of handling it, and that’s why I am glad we’re able to discuss this and listen to each other’s opinions. We could also settle it with an old-school Jamaican stick fight. But the authorities frown on that as does the state stick fighting commission which surely would not sanction the event. Bummer, we could’ve sold tickets! It’s really the sanctioning that’s hard. Guess I’m having a hard time seeing how competition for positions that at best get honorariums fits into your statement. Take something that is scarce like HAAS training or Multicam or some of the other classes that routinely get posts asking about if/when a spot will be open. How would losing the teacher of these make who better?